What Are The Types Of Hobs? Utilise a gas flame to heat cookware. Instant heat control and visual feedback when controlling the flame. There's a wide variety of designs and finishes: as a rule, enamel is easier to clean than glass or stainless steel. Buy a gas hob with a wok burner, or place a grill on top for barbecuing. Look for flat cookware supports (trivets) that provide a stable support for your pots and pans. Use electricity to heat an element, which heats cookware on contact. 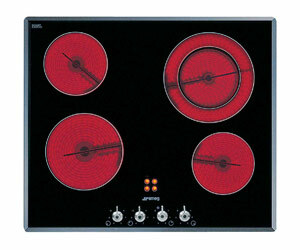 Ceramic radiant hobs: Use coiled metal elements under tempered ceramic glass. Other ceramic hob elements use halogen bulbs to create heat. Semi-halogen burners combine a halogen bulb with a coiled metal element. Radiant coil hobs: Found on cheaper stove tops, radiant coil hobs utilise a coil element to heat cookware directly. Solid hotplate hobs: A low-cost electric option. Slower to heat up and cool down than other hobs. Induction - Induction coils on the hob generate a magnetic field that induces heat in cookware placed on top. Essentially, the saucepan or pot becomes the element, so the hob surface doesn't get hot. Since most of the energy is produced in the saucepan itself, the heat response is quicker and more efficient. Induction is the fastest cooking method, taking much less time to boil up water. Combination hobs - If you can't decide between gas and electricity, have the best of both with a dual-fuel hob, such as a gas set-up with an electric element. Induction hobs: Cookware needs to be close to the same size as the diameter of the hotplates. Pans that overhang won't heat properly around the edges, and those that are too small won't be recognised. 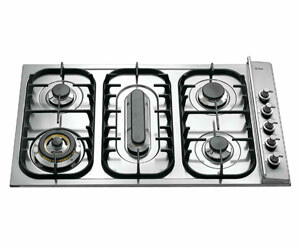 Electric and gas hobs: Choose pans with a flat base for good contact with the element. Temperature Control – What's Its Function? One of the most important elements of cooking and food preparation is temperature control. A hob that heats up too fast, or is unpredictable can burn food. Gas hobs are more controllable than electric hobs. Electric hobs are useful for cooking at low temperatures, such as a slow simmer. Induction is just as controllable as gas, with fast responsiveness to changes in heat settings. Should I Consider Size And Space? Take into account where your hob will be installed. Do you have the bench space to fit it? Also consider the ventilation and clearance for both the cooker hoods and cupboards. Is Design A Significant Factor? A good hob will have an easy-to-clean design – a flat surface, free of dirt traps. Induction hob are easy to clean because their flat surface doesn't heat up, meaning food doesn't bake onto the surface. Look for easy-to-use control knobs; a good size, with easy-to-read temperature level markings. Cost: A ceramic hob is the most affordable option. Space: Choose a hob that uses your kitchen bench space most effectively. Cookware: Save money by using your existing pots and pans. Size: Look for a hob with more than the standard four elements. Speed: Induction hob are quick and can save time. Safety: The elements will not start to heat up until a pot is detected. Elements will not heat up when a hob is accidently turned on. Control: As the industry standard, a gas hob gives instant heat control. Design: Look for a hob that's easy to clean as you cook. Versatility: Gas hob can be had with a wok burner and hotplate. Cooking control: Gas and induction offer the most control over your cooking. Energy efficiency: Induction hobs lose little heat thanks to direct contact with pots and pans. Size and space: Ensure you have the necessary bench and ventilation space to fit your new hob. Safety: Many electric hobs have a residual-heat warning light that stays on until the hob has cooled. Accessories: Look for wok burners and grills on gas hobs.